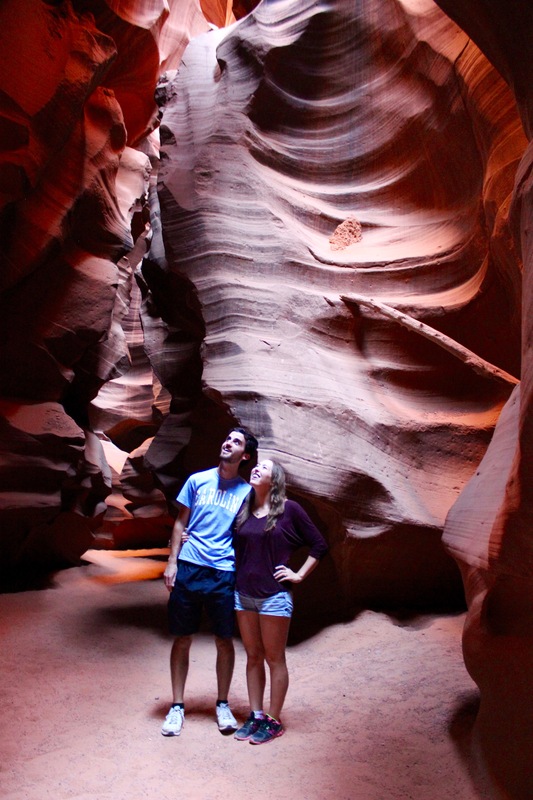 On day 3, we took a tour of Antelope Canyon in Page, Arizona! 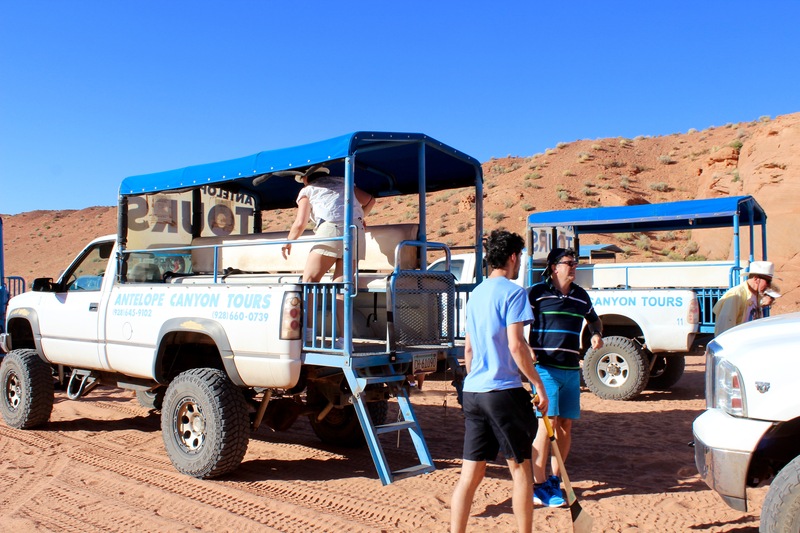 Our specific tour was a 4:30 PM Sightseer’s Tour of Upper Antelope Canyon and was booked through Antelope Canyon Tours, Inc.
We arrived a bit early for the tour due to sheer excitement and signed in. We were assigned to the “gray team”. We then sat there eagerly sipping our coffees until our smiling guide called for our team to hop aboard the van to the Canyon. 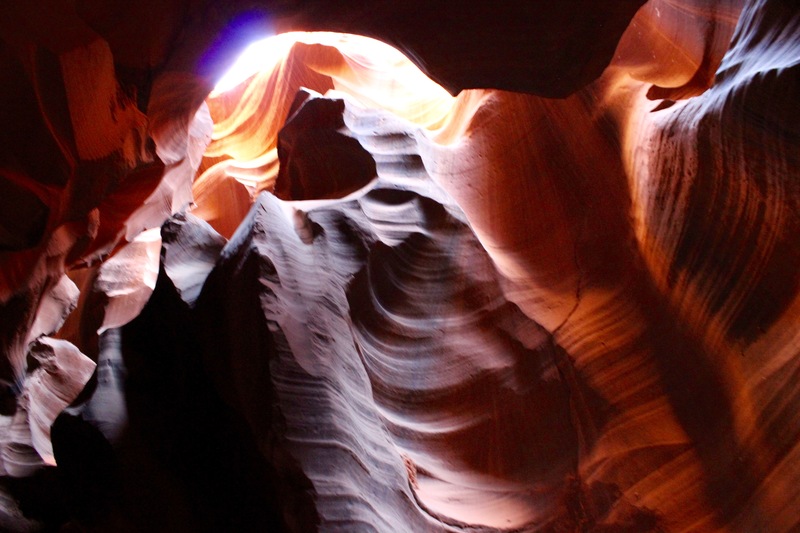 The van ride to and from Antelope Canyon was an experience in it of itself. We sat in the back of a pick-up truck, buckled onto a long, couch-like seat while holding on to the bar in front of us. The ride got a bit bumpy, as we hit rockier terrain, and felt a bit like a real-life roller coaster. 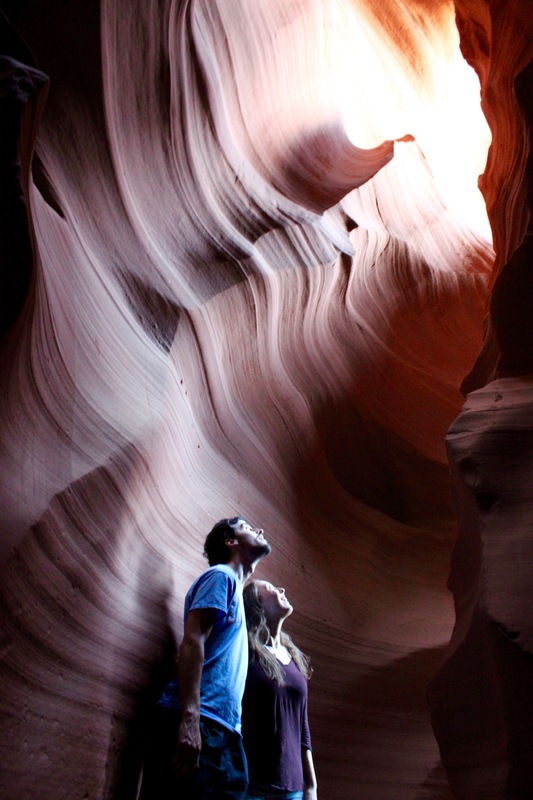 Once we got to Upper Antelope Canyon, the guides were super helpful. Our guide walked us through the whole journey and even helped us take pictures. Walking through the Canyon was a surreal experience. 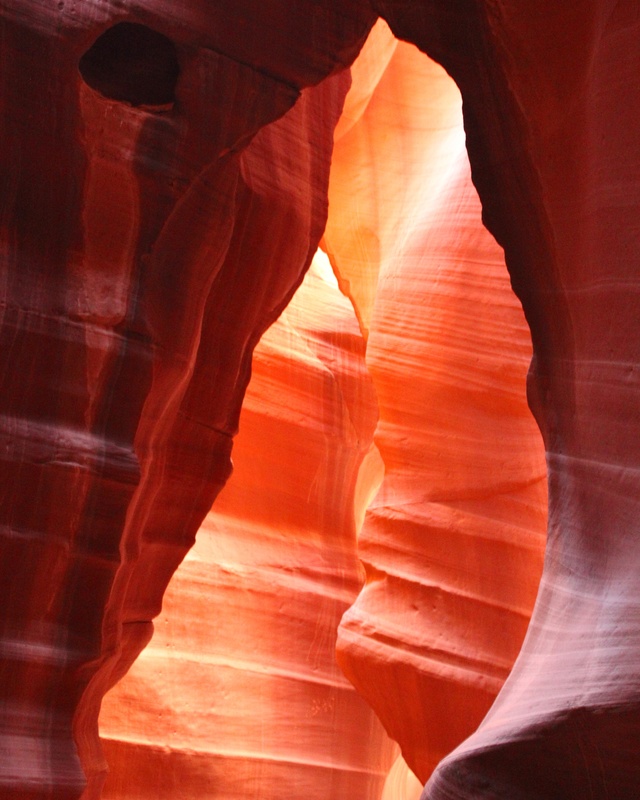 Light beams shined in through openings above the Canyon and lit the orange-colored rock with a golden glow. The rock had a smooth and sandy texture and, as we walked deeper into the Canyon, the openings got smaller and darker. The tour brought us through Upper Antelope Canyon, out the other side, and then back through the Canyon where we started. It was crowded, especially in the tighter areas, but there was definitely enough room to take pictures or video and get a good look at the Canyon. The tour was a bit pricey, but I thought it was totally worth it. 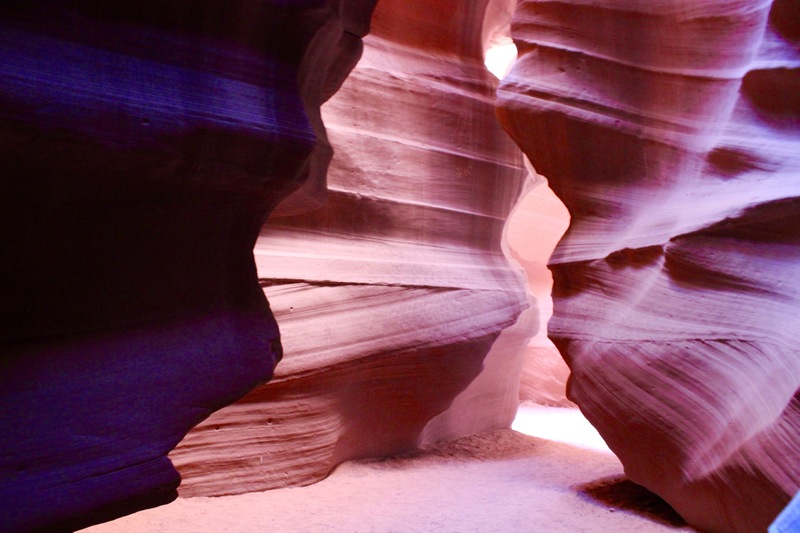 Antelope Canyon was unlike anything I’d ever seen and I felt privileged to be one of the few to get to see it. Book online. Most of the tours have websites that allow you to do this. It makes it a lot easier. Plus, the tours sell out quickly, so it guarantees you a spot. Go to the bathroom before heading out on the tour. There are no public bathrooms once you’re there. Book an earlier tour if you can! Our tour was at 4:30 PM and it started to get very dark towards the end. Bring a small flashlight to help you better see the canyon. Don’t bring selfie sticks or tripods. My tour forbid it and many other tours do as well. 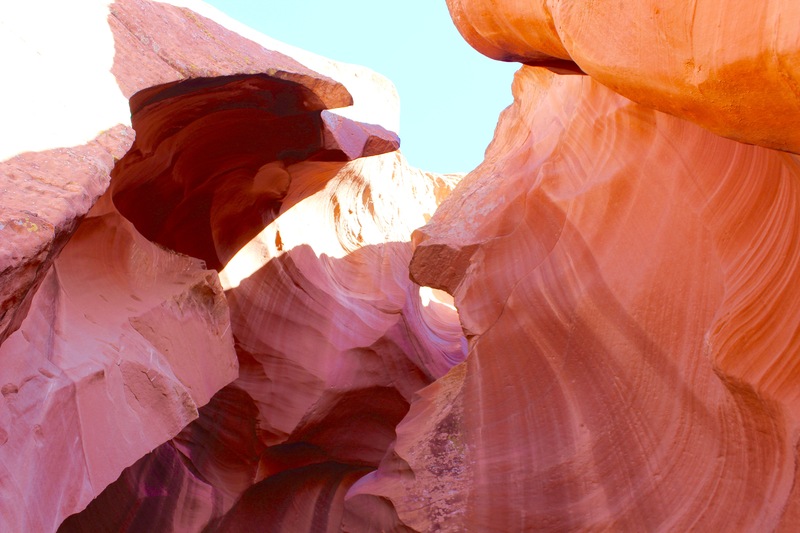 I hope this post helps you plan a beautiful trip to Antelope Canyon in Page, Arizona! It is definitely a place you’ll never forget!